The first thing that I would recommend that you do, is go to the Practice Paper Piecing Page. When you feel comfy with paper piecing, come on back and try a Sparks Block! You will need to print out two copies of each template page per block you want to make on very lightweight paper. Fat Quarters will be fine! After your units are all paper pieced, join them as shown at left to complete the block! Here's a four by five quilt with pieced border! 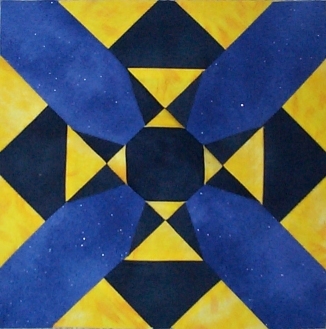 **Playing around with quilt ideas- HERE(A) I alternated the location of the dark and medium blues in alternating blocks...but the one I REALLY like is HERE(B) where I alternated the location of the yellow with the location of the dark blue in alternating blocks, WOW....awesome quilt, if I do say so myself!